Our hectic lifestyle paves the way for acidity as we prefer to consume junk instead of healthy food products. Heartburn, bloating, burning sensation in chest, heaviness in abdomen, are some of the common symptoms of acidity. 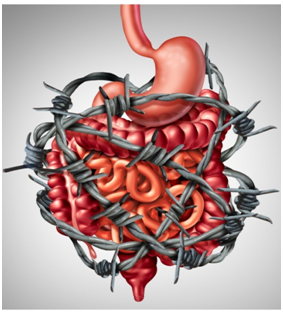 Acidity, if left untreated, can lead to chronic and serious problems like GERD, ulcers, Esophageal Stricture, etc. Spicy food, fast food,canned and preserved food products. Side effect of consuming antibiotics, painkiller or NSAIDs. Stress and lack of sleep or irregular sleeping habits. Change your eating habits- Avoid eating anything that causes acidity and stick to a more balanced and natural diet. Maintain a healthy lifestyle- Eat at regular intervals and make it a habit to eat on time. Get adequate sleep at night. De-stress yourself- It is essential to keep your mind healthy and away from stress and negative emotions. Adopt yoga and pranayama practices to achieve this. Reduce stimulants like tea, coffee, alcohol. Drink atleast 1.5-2L of water everyday. How to naturally cure acidity? The question that arises is what should be done if one has acidity? It is such a common problem that anyone can suffer from it. Despite keeping a healthy lifestyle, acidity still troubles most of us. Ayurveda is the only option that can provide the quickest and permanent solution for acidity. Herbs like Amla, Mulethi, Udumbur, Gokhru are some of the most researched herbs that cure acidity most efficiently. These herbs need to be mixed in their pure form in proper composition to get permanent relief from acidity. 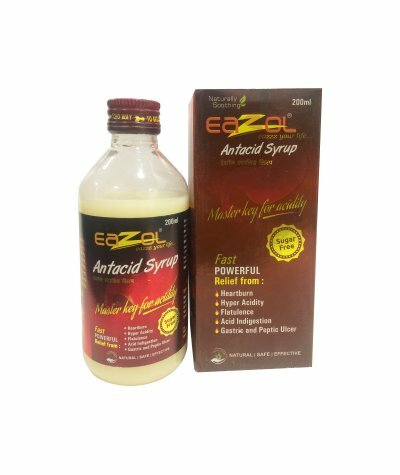 Eazol Antacid Syrup is a blend which comprises a perfect mixture of all these herbs. Understanding acidity and its causes,herbs like jatamansi are added to this combination, so that it works not just on curing the problem at physical level but also address factors like stress and lack of sleep. 2 tsp three times a day, 15 minutes before consuming a meal, is all one needs to forget about acidity. This formula works instantly, so if you suffer from occasional acidity 2tsp. is all you need to take for immediate relief. This product is available on Ayurvedamegastore for online purchase and gets this product at your doorstep. Eazol Antacid Syrup– the solution to your gastric trouble.